OFF THE MAREKT. This place is now being showcased in our category called: Show Your Garage ... anyone can showcase their garage in this category and run it for free for one year at a time. 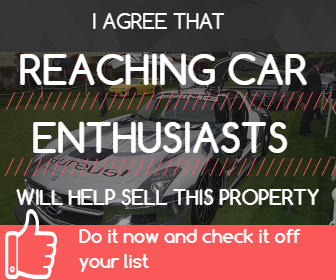 To post your garage (it cannot be for sale or rent) in the Show Your Garage category, just click on the Advertise tab and click on Place a Classified Category AD. A truly beautiful property offering tremendous space for grand entertaining and refined living, the legendary Rio Hondo Estate exudes timeless elegance and extraordinary style for this once-in a lifetime opportunity and is a car collectors dream. The 14.42-acre luxury residence located in the beautiful hill country is improved with over 3,900 square feet of living space and offers the best in fine living with awe inspiring panorama views. Attention to detail was given to each part of this home showcasing different characteristics of the 1920s era, without losing today's modern efficiency conveniences. Interior features include a grand two story high living room, retro inspired eat-in kitchen with all the latest modern conveniences, a wonderful master suite boasting period based details, two additional bedroom suites, two full baths, 1 half bath, two exquisite fireplaces and a temperature controlled bonus second living area or hobby room. Outside, you are welcomed by a wonderful wrap-around porch, perfect for enjoying those starry nights or warm sunny days. Garage Description Store your cars in style in a steel and block period Sinclair Gas Station replica. The finest details were put into consideration when building this 3,600 square foot, climate controlled garage space. Tile work, bar stools, booths and a fully functional twenty-seat soda fountain bar convince you to take a step back in time in this charming and very realistic custom home.